There are times when updating a classic look to something totally different doesn't work, and then there are times when it does. Changing Spider-Man's classic costume is one of the things you wonder if you should change, but when Marvel did it they found the new costume worked better than anyone thought, not only from the look of it but also from the consequences that played out later. The Secret Wars mini-series was revolutionary at the time for several reasons. It had a merchandising push based directly from the comics in a toy line from Mattel. It was a mini-series that told a complete story and then stopped after twelve issues. It was a huge crossover event for Marvel Comics and highly successful. And yes, it brought a brand new costume to the Spider-Man mythos. The costume made its debut in Amazing Spider-Man # 252 but chronologically it first appeared in Secret Wars # 8. This is because while the Secret Wars mini-series only lasted a week in 'Marvel Universe time' (basically existing in many books as a simple the hero goes in a portal in one issue and returned in the next issue) the twelve issue series took a whole year to be told to readers. During the saga all the major heroes and villains of the Earth are kidnapped by the Beyonder, a powerful being who creates a battle world for them to fight for his (and the reader's) amusement. After Spider-Man activates a machine, a small ball comes out, and it becomes a brand new costume. The costume can change its appearance (turning into civvies for example) and could even create webs. The thing that isn't revealed until later is that not only is the costume alive, but it is becoming quite attached to Peter Parker and forming a symbiotic relationship. Peter eventually rejects the symbiote, and that's when bad things happen. The symbiote eventually merges with Eddie Brock, a man who hates Peter Parker just like the symbiote does. The two form a new creature - Venom, and he becomes one of Spidey's toughest foes. 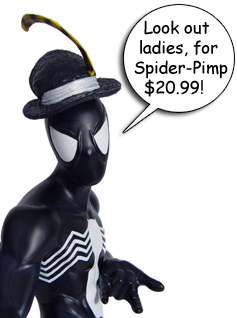 That's a story for the Rogue's Gallery Venom bust, this is the Spider-Man version! 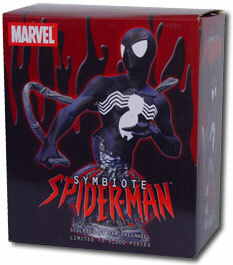 If the Symbiote Spider-Man bust looks familiar, it's because Diamond Select Toys has used the basic bust twice already. Once for the Ultimate Spider-Man bust, then again for the Unmasked Ultimate Spider-Man bust. 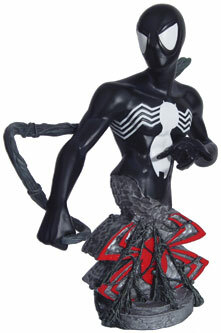 Now the same basic design is used to capture the pitch-black version of Spider-Man. Like the prior two busts, Sam Greenwell is the sculptor and this bust is limited to 5000 pieces. Just think of it as having Spidey in 'home' and 'away' jerseys! The bust is a nice use of a previous bust, except this time the bust is smooth and very dark. The base of the bust turns the spider logo to red, but otherwise what you have is essentially the same bust as before with a different paint job. That and this is the regular Marvel Universe Symbiote Spider-Man when the prior one was the Ultimate Spider-Man. Got all that? 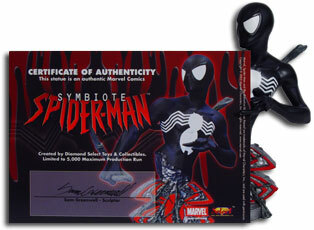 Where to buy the Symbiote Spider-Man Bust: This piece is limited to a run of 5000, and retails for between $40 and $45 USD. You can find it at your local comics shop, TowerRecords.com , and various online retailers.